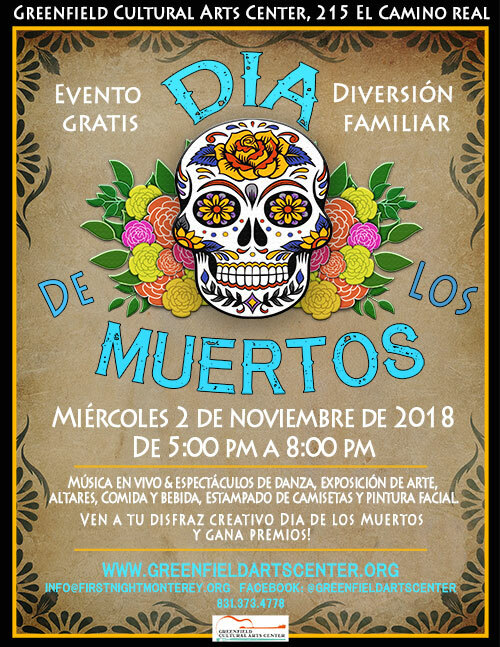 Greenfield Cultural Arts Center presents the third annual Día de Los Muertos festival! The festival will celebrate Día de los Muertos tradition with a display of altars to honor those who have passed, artwork by local Greenfield students and folkloric dance. The public is welcome to come dressed in the spirit of Día de Los Muertos and a costume contest will be held with prizes. Join us for family fun, food and drink, live music and dance, face painting and art activities! Come in your most creative Día de los Muertos costume and enter to win prizes for most creative costume! 6:15 – 6:45 Art, Food, Music!